White House Repeats: Time For 'Transition' In Egypt Is Now : The Two-Way If any of the "outrageous violence" in Egypt today was "instigated" by that nation's government, "it should stop immediately," White House spokesman Robert Gibbs just told reporters. If any of the "outrageous violence" in Egypt today was "instigated" by that nation's government, "it should stop immediately," White House spokesman Robert Gibbs just told reporters. And, repeating a message the White House issued earlier today, Gibbs said that "the time for a transition" in Egypt "has come and that time is now." 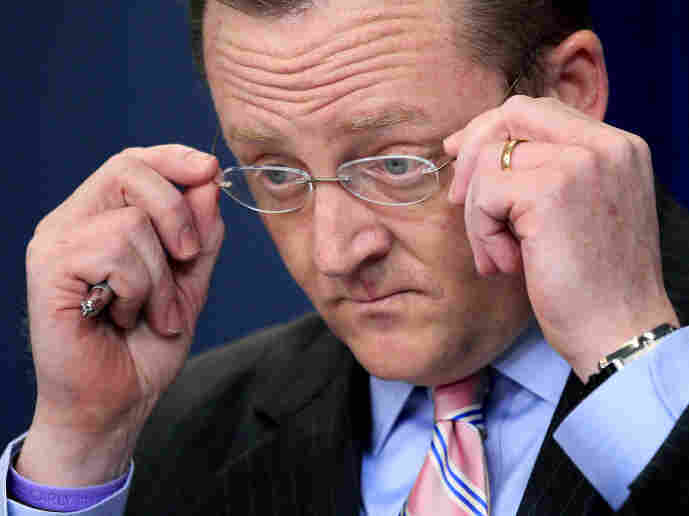 White House Press Secretary Robert Gibbs, Feb. 2, 2011. We'll update this post with more from his briefing and what Gibbs says about U.S. relations with Egypt and President Hosni Mubarak as it continues. Update at 2:07 p.m. ET: Gibbs says that when President Obama spoke with Mubarak yesterday, the American leader repeated that the U.S. wanted to see Egyptian authorities continue to act with restraint toward the anti-Mubarak protesters. "We received no indication on that call about any action that might take place" such as the violence today in Cairo's Tahrir Square, Gibbs says. Update at 2 p.m. ET: Pressed again about whether the administration's position that the "transition" must happen "now" means that Mubarak must leave office now, rather than after elections in September, Gibbs says "I'm not going to get into more specifics about what the two presidents [Obama and Mubarak] talked about." Update at 1:57 p.m. ET: Was President Obama angry when he saw what was happening in Tahrir Square today? Gibbs says Obama found the violence to be "outrageous and deplorable." Update at 1:40 p.m. ET: Asked if the U.S. has made it clear to Mubarak that aid to Egypt could be slashed if he doesn't do the right thing, Gibbs does not answer specifically. He does say, though, that "I do not think the president [Obama] could have been clearer with the president of Egypt last night" when the two leaders spoke. Update at 1:36 p.m. ET: Does the U.S. suspect today's violence in Cairo was instigated by the Egyptian government? Gibbs says "I shouldn't hypothesize." Update at 1:35 p.m. ET: "The world is watching and the world is commenting on what we've seen happen and what we know must take place over the many days and weeks," Gibbs says. Update at 1:30 p.m. ET: Mubarak has said he will remain in power until after an election in September. Is the Obama administration, which says the time for a transition is "now," satisfied with that? September is not now, Gibbs says. Update at 1:25 p.m. ET. Gibbs is asked: Does the administration believe Mubarak is a dictator? Mubarak has "a chance to show the world exactly who he is" by how he handles the "transition," Gibbs says.